As many of you know, Brett and I started Woodinville Whiskey Company almost 10 years ago. What started as a humble dream of ours has turned into more than we could have ever imagined. To date, we’ve produced over 12,000 barrels, each by hand, with special care and attention to each and every barrel. We’re extremely excited to announce that on March 9th, 2019, we will be releasing barrel #001 of our Flagship Straight Bourbon. This barrel was the first barrel in the first batch of full-size barrels we ever filled on January 24th, 2011. It is over 8 years old and the oldest whiskey we have released to date. We could not be more proud of the liquid in the bottle and the journey it has taken. 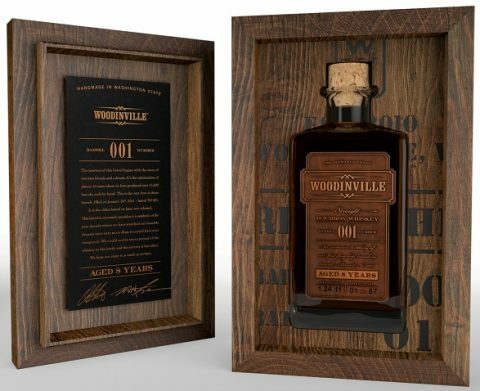 We are bottling the whiskey at 100 proof (Bottled in Bond) in a special collector’s bottle and commemorative wood case. The labels are made of stamped pewter and each wood case is being built and stained entirely by hand. Each person will also receive a commemorative wood pen that is made from the staves of barrel #001 and etched to match the number on their bottle. Due to some very greedy angels (“the angel’s share”/evaporation) we only have 87 bottles available. Because of this limited amount we will be drawing names on February 26th. If your name is drawn, then we will email you a link where you can purchase the bottle online. It will be available for pickup on March 9th here at the distillery. Bottle numbers will be given in the order the names are drawn. You will also get to taste the whiskey at cask strength when you come to pick up your bottle. Each bottle will be $500 which will include all taxes. To enter the drawing to purchase a bottle of barrel #001, click here and enter your information. The drawing will be held on Tuesday, February 26th at 1pm on our Facebook page via Facebook Live. For all names drawn, we will send out an email with a link to purchase the bottle. You will have 48 hours to complete your purchase. This barrel is a culmination of the past decade and the incredible journey we have been on. There will never be another barrel like it. We could not be more excited to share it with you! omg!!! eek Im so excited. just visited your facility last week and in love with the product!!!! My husband is a huge fan of your bourbon. I would love to get the opportunity to purchase this as a gift for him as he is an incredible father and husband! This could be the most wonderful thing in the world. My boys in my family are bourbon crazy. I mean crazy. I just got a job as part time bartender at a bourbon bar. Something I have never done. I am 62. I gave soenor the last two weeks filling in all the cracks about things I didn’t know. My boys Don think I can do it. This would totally freak them out. It sounds amazing. Leave a Comment (*Required Fields). Click here to cancel reply.